Test fitting the bare housing under the springs after it was narrowed. 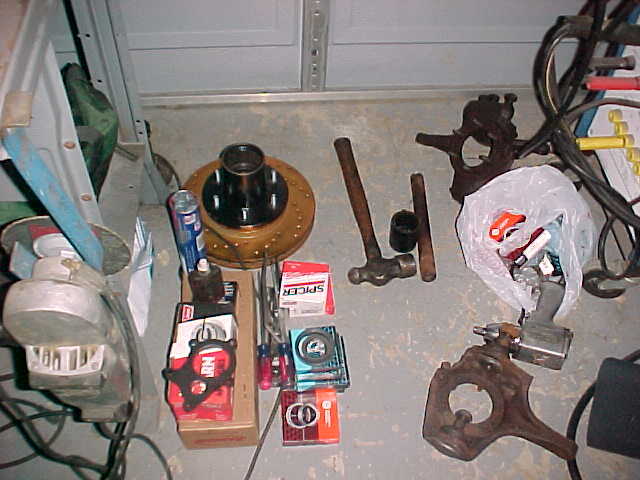 Some of the parts and tools used on the Dana 44 from the knuckle out. When we left off last month we had added leaf springs to the front of our pickup in place of the factory independent front suspension. Now came the time to add a solid front axle. 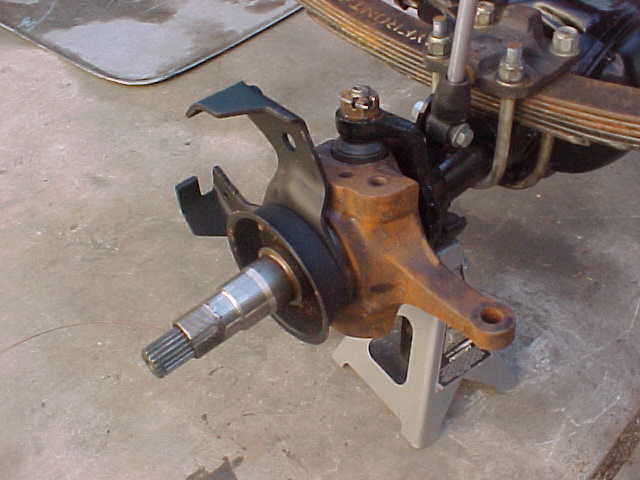 Most people converting a 1986 and later Toyota from independent front suspension to a solid front axle use a factory Toyota axle from a 1985 or earlier pickup. There are numerous benefits to using this axle. The bolt pattern, axle width, and spring perch width do not need to be modified and crossover steering is only a phone call away. Using a Dana 44 front axle as an alternative however offers numerous benefits and remedies some of the Toyota axle's shortcomings, namely the birfield joints. Originally I planned on purchasing a hybrid axle with a Toyota center section and Dana 44 knuckles. This option would allow for the use of a front high pinion electric locker from an FJ80 and retain the Toyota ground clearance while improving turning radius and strength with Dana open knuckles. Unfortunately the cost of this hybrid made me explore other options. I ended up getting a free Dana 44 housing out of a Chevy Blazer from a friend. The Chevrolet housings are ideal for Toyota applications because the differential is on the passenger side, there is a spring pad cast into the top of the housing, and they have the same six lug bolt pattern at the stock Toyota axles. Since I only had the bare housing, I purchased a complete front axle from a Jeep Wagoneer and used the knuckles, spindles, hubs, and shafts (all but the long side) in the Chevy housing. It should be noted that the Wagoneer hubs utilize different bearings and races from Chevy hubs, but fit the Chevy brake rotors without problem. I began by disassembling everything to narrow the housing. I had the housing narrowed to 58 " by Niles Engineering to match the Toyota IFS rear axle. This removes the need for costly wheel spacers that are often used with Toyota solid front axles. Further cost savings can be realized by utilizing the stock Chevy u-bolt plates in lieu of expensive "flip kits" that are necessary with high crossover steering on stock Toyota axles. The inner knuckles were heated and pounded off of the axle tubes and the tubes were then cut with a chop saw. Next, Niles Engineering rewelded the knuckles on with seven degrees of positive caster to aid tracking. 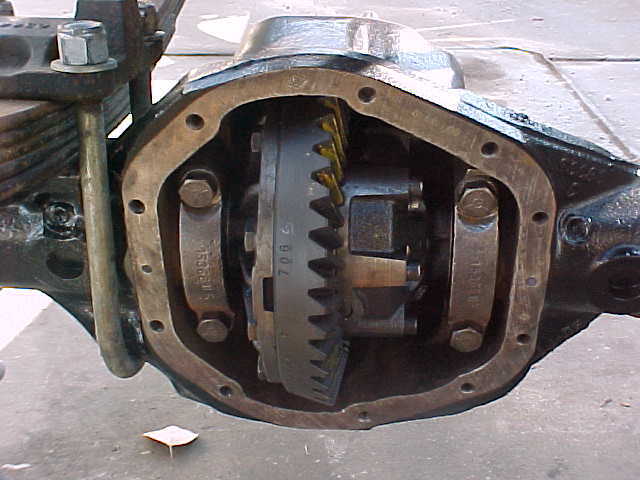 The caster was set relative to the spring pad on the housing, which was milled 12 degrees to rotate up the pinion and point it at the dual cases. A matching spring pad was then welded on to the driver's side axle tube. 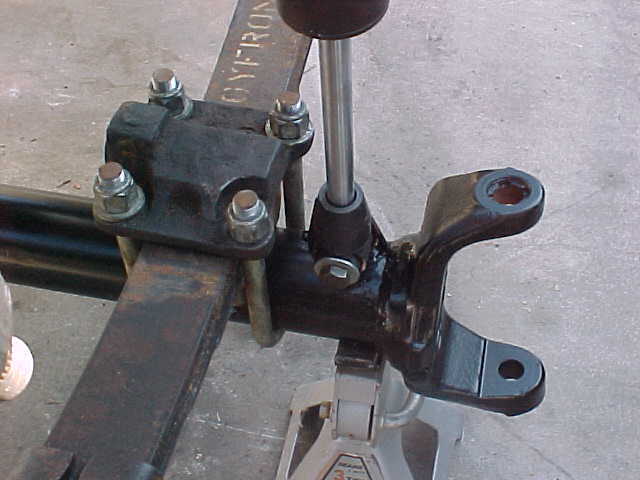 Note that the All-Pro springs have the center pin moved forward from the bottom of the arch of the spring and will affect the caster and pinion angle. 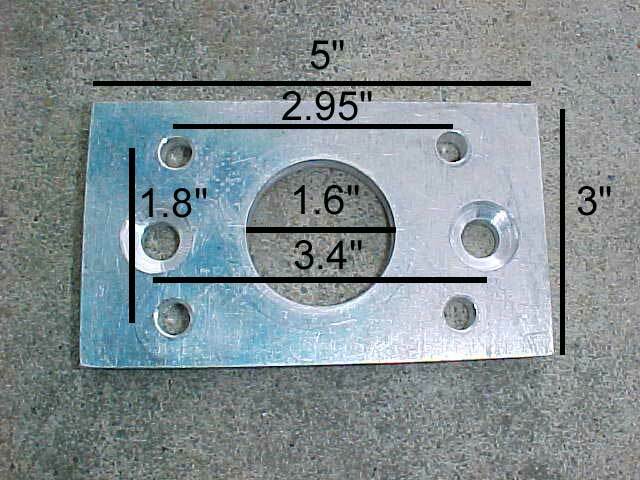 The stock Chevy spring plate can be re-used to cut down costs. 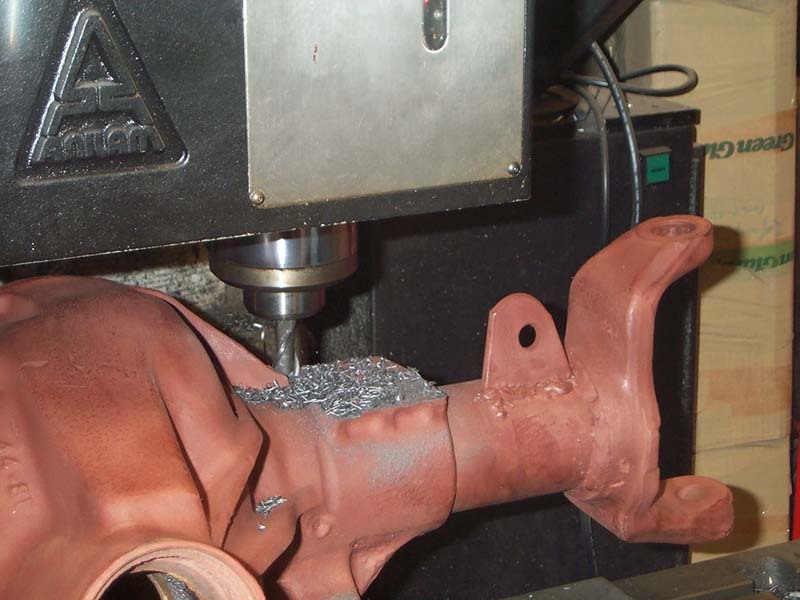 Milling the pad on the housing to rotate the pinion up towards the transfer case. 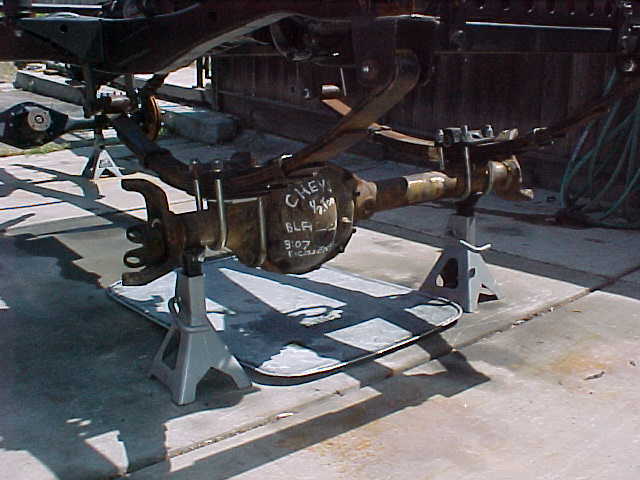 Others have used Dana 44 axles out of Wagoneers for their axle swaps. The benefit to these axles is that at 61" wide they do not need to be narrowed. Since I was changing the caster angle though, narrowing the axle was not a large additional step. The Wagoneer axles come from the factory spring under and require new spring perches, as well as a slightly more complex outboarded spring hanger. The wider spring spacing has been known to offset the gains in turning radius that open knuckles offer. Some Wagoneer axles do not offer the 1/2" thick axle tubes available on the Chevy housings either. Dutchman did an excellent job of cutting and resplining the long side axle shaft. The new 58 " width of the housing allows for the short side axle from the Wagoneer to fix into the short side of the Chevy housing. A Chevy long side axle was sent to Dutchman Motorsports to be cut down to 29.5" and resplined for the long side. 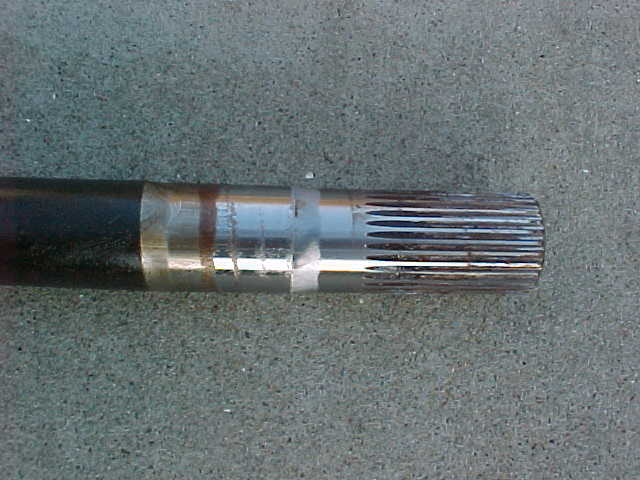 Both shafts were connected to the stubs with new Spicer 5-760X u-joints. Moving outward, the knuckles were prepared for high crossover steering. 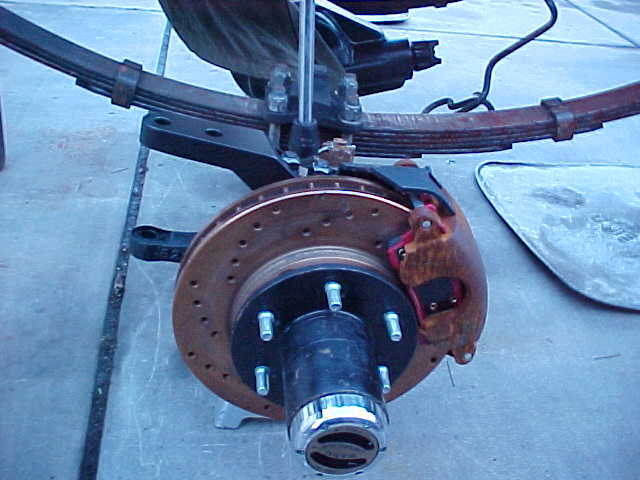 The driver's side knuckle only requires that the stock steering arm be replaced with a crossover steering arm, while the passenger side knuckle needed to be machined, drilled, and tapped in order to mount the steering arm. It is also necessary to start with a "flat top" knuckle when performing these modifications. While the knuckles were off they were loaded with new Moog upper and lower ball joints (PN K8194 and K8195) from Summit Racing. The axle outers were rebuilt with new seals and Timken bearings and capped with Warn hubs from 4Wheel Parts Wholesalers. The hubs feed power to the 1 5/16", 30 spline axle shafts. Niles Enterprises setup the Detroit locker and 4.89 Spicer gears to match the rear axle gears. The rest of the axle, hub, and brake setup was done by my in-house mechanic (read: Dad). Installed gears and Detroit locker. The adapter from the brake booster to the master cylinder. Chevrolet brake calipers and rotors are much larger than the Toyota options, even the "upgraded" V6 calipers and vented rotors used on many solid axle swaps. Because the calipers push so much fluid, use of the stock master cylinder results in a mushy brake pedal. 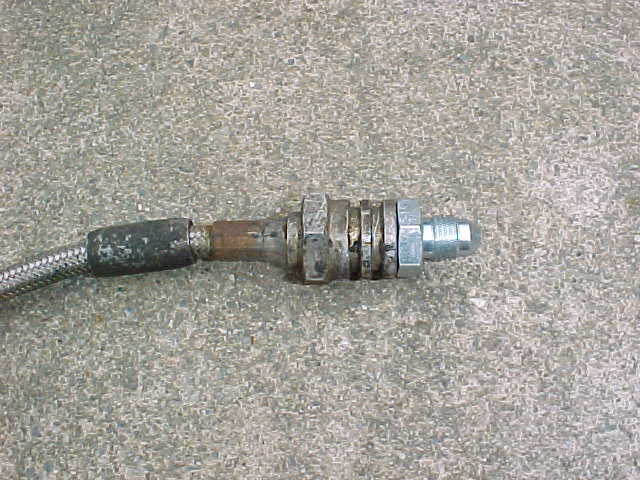 In order to remedy this problem I used a 1 " bore master cylinder (stock Toyota is 13/16") from a 1979 3/4 ton Chevy truck. The Chevy master cylinder uses standard fittings so the metric Toyota ends were removed and replaced with standard American fittings. 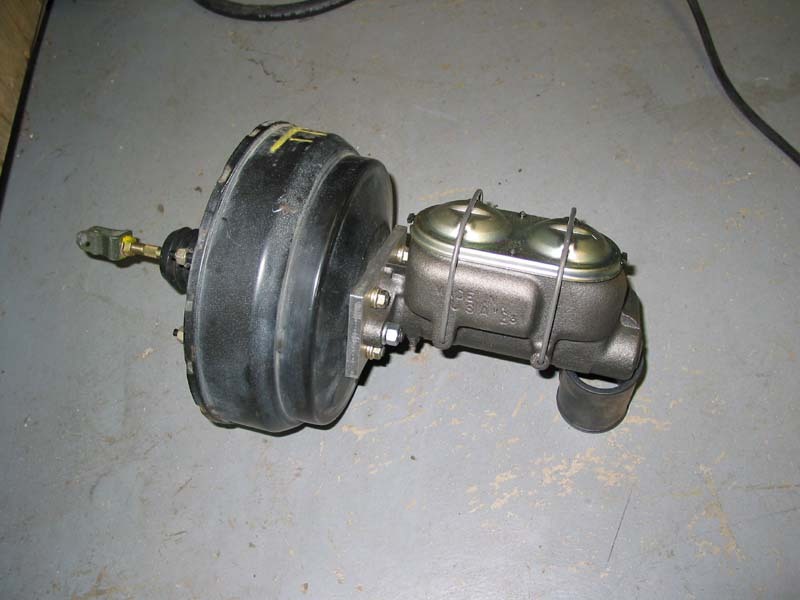 Also used was a T100 brake booster I purchased from Toyota Truck Parts (TTP). The T100 booster is a dual diaphragm design and helps to reduces pedal effort. The brake booster and master cylinder were mated together by a custom adapter that my father fabricated out of a piece of 0.40" aluminum we had around the shop. A 1.6" hole was drilled in the middle of the 3" x 5" adapter to seat the master cylinder and countersunk holes were drilled 3.4" apart to attach the cylinder flush to the brake booster. Finally, four holes were drilled in a 2.95" x 1.8" pattern to bolt the adapter to the brake booster. The spindle and beefy caliper mount, ready for brakes. 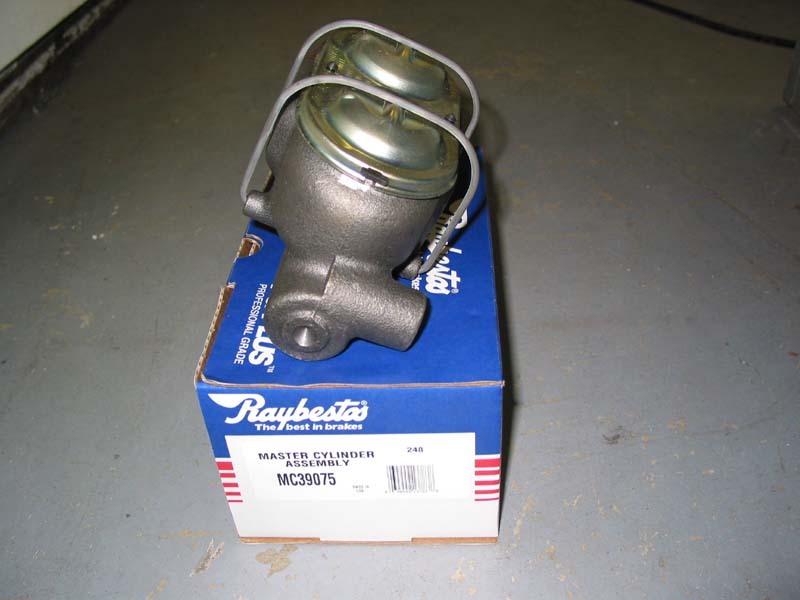 The Raybestos master cylinder for a 3/4 ton Chevy. The Chevy master cylinder mated to the T100 brake booster. My existing Pro Comp extended brake line with the Earl's adapter on the end. Rebuilt calipers were purchased locally and mated to Power Stop cross drilled rotors. The cross drilled rotors are overkill for this application, but they match the rear All-Pro disc brakes nicely. The rotors connect to the hubs and the wheels with Dorman metric wheel studs (PN 610-264) in order to reuse the stock lug nuts. I already had Pro Comp extended brake lines, so I purchased Earl's 10mm to 3/16" brake line adapters (PN 592032) from Summit Racing in order to reuse my existing brake lines. The installed brake rotors and calipers. Be sure to follow along next month when the axle swap is completed with custom steering components and a long travel driveshaft.